Looking for Six Flags Theme Parks? Six Flags is synonymous with coasters and thrills. Bugs Bunny and the Looney Tunes gang are on hand (along with the Justice League), and young kids will find rides, shows, and other attractions geared just for them. But the theme park chain is best known for its wild thrill machines. And by wild, I'm talking about some of the most extreme rides on the planet. Take Kingda Ka at Six Flags Great Adventure in New Jersey, for example. At 456 feet tall and 128 mph, it definitely gets riders' attention. (If you're curious how the mega-thriller stacks up to other rides, check out my rundowns of the world's 10 fastest roller coasters and the 10 tallest roller coasters in the world. Kingda Ka is just one of dozens of crazy coasters awaiting thrill seekers. More recently, Six Flags has been introducing sophisticated, story-based dark rides at some of its parks. Featuring roving motion-base vehicles, 3-D immersive media, and interactive game play, the wonderful E-Ticket attractions compare favorably to rides found at the Disney and Universal parks. You can read more in my review of Justice League: Battle for Metropolis. In 2016, Six Flags was among the first to introduce virtual reality experiences aboard its roller coasters. By combining actual ride thrills with a VR overlay, the parks are able to offer otherworldly experiences. Read more in my feature, Virtual Reality Coasters Roll Out at Six Flags. The popular parks can get very crowded. On especially busy days, you may want to consider purchasing its skip-the-lines premium upgrade. To help you determine whether you might want to get the add-on passes read my feature, "Is Six Flags' The Flash Pass Worth the Cost? If you are looking for parks, Six Flags locations are arranged by U.S. state below. Canada and Mexico follow at the end of the list. It is a hybrid zoo/oceanarium/amusement park. Among the highlights are the the hybrid wooden-steel coaster, The Joker, the launched coaster, V2: Vertical Velocity, and the floorless coaster, Medusa. Note that the park used to be known as Marine World. Among its standout coasters are a well-regarded hypercoaster, Goliath, Superman: Ultimate Flight, a flying coaster, and Dare Devil Dive, which offers a VR experience. The water park, Hurricane Harbor, is included with admission. The thrill-crazy park offers one of the world's tallest and fastest wooden coasters, Goliath, the wild "wing" coaster, X-Flight, and the ferocious "impulse" coaster, Vertical Velocit. Check out the 9 best rides at Six Flags Great America. The water park, Hurricane Harbor, is adjacent to the dry park and requires a separate admission. The 200-foot Superman: Ride of Steel hypercoaster is a highlight along with The Wild One, a wonderful, old wooden coaster. The water park, Hurricane Harbor, is included with admission. Its great collection of coasters includes Superman The Ride, my pick for one of the best steel roller coasters, and the hybrid wooden-steel coaster, Wicked Cyclone. It also offers one of the world's tallest swing rides, the New England SkyScreamer. The full-featured water park, Hurricane Harbor, is included with admission. The St. Louis Six Flags is one of the parks to offer the Justice League: Battle for Metropolis ride. Coasters include the electromagnetic powered coaster, Mr. 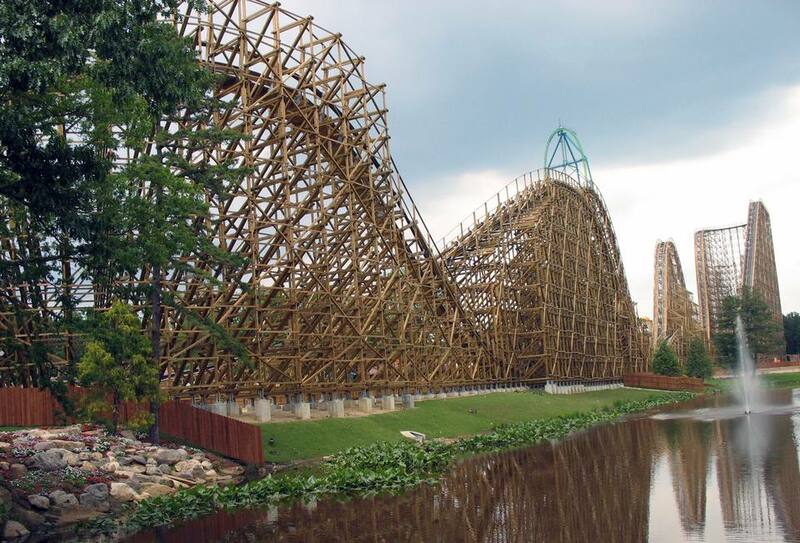 Freeze: Reverse Blast, and the wooden coaster, Screamin’ Eagle. Its water park, Hurricane Harbor, is included with admission. One of the most popular parks in the chain, Great Adventure is home to Kingda Ka, the wonderful wooden coaster, El Toro, and the superb hypercoaster, Nitro. The enormous Six Flags complex also includes a Wild Safari experience with live animals. Among its highlights is the wonderful (and underrated) wooden coaster, The Comet. It also offers a VR coaster, Steamin’ Demon. The outdoor water park, Splashwater Kingdom, is included with admission. Adjacent to the park is Six Flags Great Escape Lodge Indoor Water Park, which is open year-round. It's no longer open, but you can read about the rise and fall of the Six Flags park near Cleveland. Its great Superman Krypton Coaster features a VR experience. Iron Rattler is a wonderful hybrid wooden-steel coaster. Batman: The Ride is a highly regarded Free Spin, fourth dimension, wing coaster. White Water Bay water park is included with admission. The original Six Flags park offers some great coasters, including the highly regarded wooden/steel hybrid coaster, New Texas Giant, and the 255-foot tall, 85 mph hypercoaster, Titan. It also offers the Justice League: Battle for Metropolis ride. The great hypercoaster, Goliath, offers a VR experience. The park also features the suspended coaster, Vampire. Mexico's largest amusement park. Includes the inverted coaster, Batman The Ride.